Ah, the holiday season. That magical time when everyone comes together. And is reminded of one thing... YOU CAN'T REGIFT FAMILY! The holidays are upon us again and the pressure is on to be in good cheer, take part in as many holiday gatherings as possible, feel festive and shop, shop, shop. I'm quite certain, I would enjoy the holiday season if it didn't feel thrust upon you and mandatory. For me, over the years, Thanksgiving, Christmas, New Years all have begun to feel like doing your taxes, getting your car inspected or a dental check up - obligations, not of your choosing. In this CBS Films and Lionsgate holiday movie LOVE THE COOPERS, the Cooper family and friends are not nearly as "Hum bug" about the holidays as I am, but they do come with their own set of baggage and troubles which don't take a back seat because it's Christmas, in fact the holiday brings everything more into focus. Charlotte (Diane Keaton) and Sam (John Goodman) have been married for 40 years and seem to want different things at this time in life. Charlotte is focused on family and almost settling into old age, where Sam wants them to take the trip to Africa they were supposed to take before they started a family. They are separating, but Charlotte doesn't want to tell the family until after Christmas. 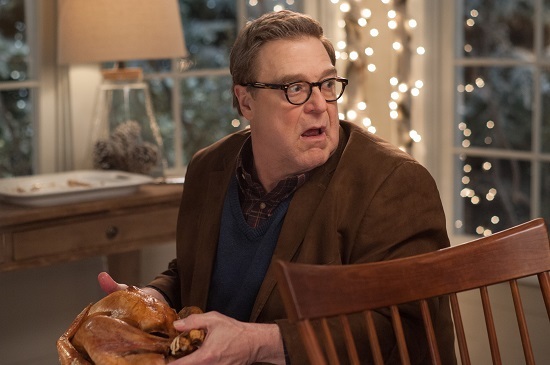 Their son Hank (Ed Helm) is recently divorced, but dealing with his ex (Alex Borstein) has not been pleasant, and providing for his family has been very difficult after losing his job as a department store photographer when they switched to a do-it-yourself digital machine. The worse time to be out of work is Christmas time. Their daughter Ellie (Olivia Wilde) feels she's got nothing good to report to her family about her life at the moment. She's a struggling playwright, seeing a married man. In the airport she strikes up a love/hate dynamic with Joe (Jake Lacy) a guy in the military heading overseas, with no where to spend Christmas, so she brings him home as her pretend boyfriend. Charlotte's sister Emma (Marisa Tomei) is not too keen on the holidays, as she isn't married, has no kids of her own, loves her nieces and nephews, but doesn't get along with Charlotte and kinda feels like an interloper, at the holidays. In a fit of resentment, Emma steals a brooch intended as Charlotte's Christmas present, gets caught and has an interesting ride to the police station with the arresting officer (Anthony Mackie). And there's more family and other side stories but you get the picture... It's time for comfort and joy and the whole world panics.. As if you can schedule happiness - Bucky Cooper (Alan Arkin). I got the opportunity to have a phone chat with Jessie Nelson (Director/Writer/Producer) whose first feature was Corrina, Corrina which starred Whoopi Goldberg and Ray Liotta. She went on to write, direct, and produce I Am Sam with Sean Penn, who received an Academy Award® nomination for his performance. And Dakota Fanning, became the youngest person to be nominated for the Screen Actors Guild Award®. 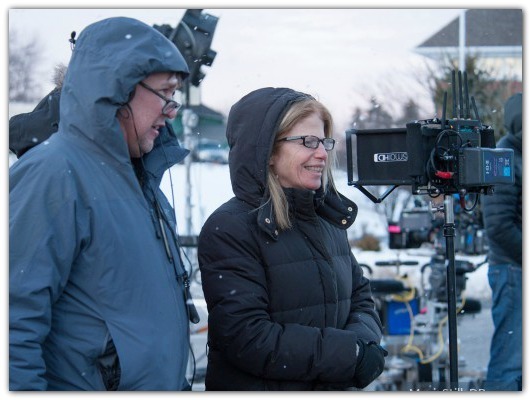 More recently she produced the Al Pacino, Annette Bening vehicle Danny Collins . She also co-wrote Stepmom with Julia Roberts and Susan Sarandon and The Story of Us, with Bruce Willis and Michelle Pfeiffer. T&T: I asked Jessie how she went from acting in experimental theatre at the Joseph Papp Public Theatre to writing and directing in Hollywood? As luck would have it, she was chosen by Columbia pictures during their nationwide talent search and was invited to come to LA. Jessie: It wasn't so much that the parts weren't coming, but I didn't enjoy auditioning all day and driving around the city and not having control of my creative space. I like to be creative everyday. So I realized at that point if I began to write, then whether someone was hiring me or not, I could always be creating and writing the kind of movies that I want to see. So with the help of a writer friend, I learned how to write, and still feel as if I'm learning, as it's a craft, like a musician. Then, I quickly learned in Hollywood how little control a writer has over their own material, so that's when I realized I also needed to learn how to direct. Jessie: I didn't really have confidence. Confidence is still something that tends to come and go, but I never felt that being un-confident is enough of a reason not to do something. I never felt that fear and self doubt should stop you. I feel like the way to conqueror fear is to do it and to learn how to grow as a creative person and as you do, hopefully more confidence will come. Cont. When I started I had a right not to feel confident, I didn't entirely know what I was doing, so those feeling were appropriate. But that didn't mean I should stop. It meant I should learn, grow, listen and stay open to learning the craft. The creative process is scary, they're days you feel more confident than others. I even saw it with some of my extraordinary actors on this piece. They'd be nervous, thinking, I'd always wanted to work with this person and now I am, and the fear would come up. But it's also what pushes someone to do really good work, challenging themselves, rising to a level. In that way, I think fear is a good part of the process. T&T: There's such warmth and heart to all your movies written and directed. But they stop at being too schmaltzy. How would you describe the stories that interest you and do you worry about being overly sentimental? Jessie: Yes, I am drawn to stories with heart and humor and I think it's a constant dance, measuring how far do you go? Is it getting schmaltzy? And I'm sure some people would feel my movies are just that, and others enjoy that aspect. I think it depends on how comfortable you are with emotions. But I also think times are tough right now, people are going through challenges in their lives - like in this story, Hank is unemployed and going through a divorce, Charlotte and Sam are questioning their marriage and Eleanor is nervous about showing up at her parents house because her life is a trainwreck at this moment. Those felt like real characters to me, real people and with it comes a certain amount of genuine emotion, because they are working through things in their lives. 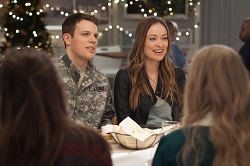 T&T: Speaking of Olivia Wilde's character, my favorite part of Love the Coopers is the chemistry between she and Jake Lacy. Jessie: We really lucked out! We had an instinct that they'd be good together and really right for these roles, but when we saw their initial dailies, were we like whoa they've really got great chemistry! Olivia is such an intelligent woman and Jake is a formidable actor, they both were making such interesting choices and doing such honest work. That's a real blessing as a director. T&T: I also had time to ask Jessie about her current project, which I can't wait to see! The Broadway version of the movie WAITRESS. Jessie wrote the book and the music is by one of my favorite singer/songwriters Sara Bareilles. I asked if she knew the writer/director of Waitress, Adrienne Shelly before her senseless death. Jessie responded no, but that she had met her husband who's been trying to keep Adrienne Shelly's legacy alive, by getting female directors to take on projects she left behind. T&T: How was it adapting the screenplay to stage? Jessie: In film you have the close ups and all those tight shots of the food. In theater, you've got to play to the 9th balcony, so you discover a whole different vocabulary and imagery, it's wonderfully challenging! I also had an opportunity to interview the food stylist on this project, but just couldn't fit it in, her name is Melissa McSorley and she was also the stylist on Chef, so I hope to be able to interview her at a later date. Jessie: We worked hard with Melissa to have the film have the sense that this food wasn't like something that you'd get in a restaurant, but something someone had labored over for Christmas dinner- beautiful food and recipes that have been handed down in this family for generations. Poor Melissa would have to provide Christmas dinner, take after take. By take 12, I would be looking at the actors thinking, 'Where's the energy in this scene'? They were in a carb coma! The actors particularly loved Melissa's stuffing. There's a couple of recipes in the production notes, From Charlotte Cooper's Recipe Collection, as an avid cake eater I posted the one for PEAR STRUESSELHUESSEN on Pinterest! Soundtrack Love the Coopers "The Light of Christmas Day" by Charles Dunkin produced by T Bone Burnett sung by Alison Krause and Robert Plant.